The first successful parachute descent by an Englishman, John Hampton, was made on this site in 1838. Hampton jumped from his hot air balloon at a height of 6000 feet in a descent lasting 12 minutes 40 seconds. On 3 October 1838 John Hampton became the first Englishman to make a successful parachute drop, when he descended from his gas-filled balloon which had risen from Montpellier Gardens, opposite the Montpellier Spa Pump Room (now The Ivy). 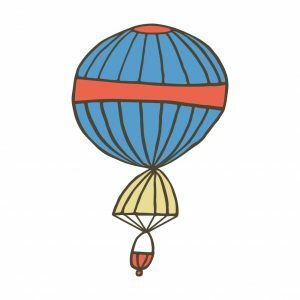 No event in fashionable locations such as Vauxhall Gardens, London, and Cheltenham, was considered complete without a balloon ascent in the early 19th century, and Cheltenham played host to some of the greatest aeronauts of the day. The most famous was Charles Green, who made balloon flights from Cheltenham in 1822 and 1837, and who completed more than 500 ascents in total between 1821 and his retirement in 1852. Competition between aeronauts was fierce, and in September 1838 John Hampton announced dramatically that he intended making a daring parachute descent from his Albion balloon in Montpellier Gardens, Cheltenham. For two days before his planned descent John Hampton exhibited his ‘improved safety parachute’ in Montpellier Pump Room. The parachute was umbrella-shaped, 15 feet in diameter, made of canvas, whalebone and bamboo, and weighed about 200Ib. Cheltenham magistrates only allowed Hampton access to the town’s gas supply if he tethered the balloon. However, on reaching 300 feet, Hampton severed the restraining ropes and at about 9,000 feet he cut loose his parachute. Spectators watched in horror as the gas-filled balloon exploded, but Hampton escaped, jettisoning 56lb of ballast before landing safely at Badgeworth just over 12 minutes later. John Hampton went on to make six further parachute descents, and had completed a total of over 100 flights in his Albion and Erin-go-bragh balloons by the time he retired in 1852.